The BCC exposes students to a new subject and way of thinking so there isn't a need to prepare for the challenge. However, you can get a feel for the style of the problems by viewing these five sample questions from a variety of grade levels. A frog gets exercise by jumping around a pond. It jumps from lily pad to lily pad in the sequence shown in the picture below. 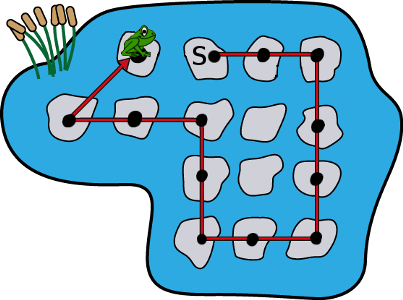 It starts at the lily pad labelled S. It ends on the lily pad as shown (i.e., the frog shown has finished jumping). Each black dot marks a lily pad on which the frog has landed. 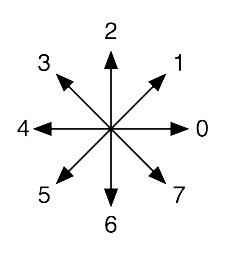 The legend below labels each of the 8 possible directions of a jump with an integer from 0 to 7. Which sequence describes the frog's path?